And bread machines are god's gift to bread lovers. Only a few minutes hand on work (maybe 10 minutes total), a couple of hours of sitting around (or doing other prep work) and viola... fresh baked bread. This recipe is for that eggy, extra rich (extra butter and an egg in the recipe) bread called a Brioche bread. Soft and moist with a beautiful crumb. The tops plump up nicely for that classic dome shape with a golden brown and delicious coloring. Add all the ingredients to the bowl of your bread machine. Use the "DOUGH" setting and all ow the machine to work (Mix, Knead and first Rise). When the cycle has finished, form into a ball and drop onto a lightly floured surface. Divide into 8 (large Buns) or 12 (Average sized) or 16 (Slider size) pieces. Shape each piece into a ball, Evenly space each ball on a baking sheet lined with parchment paper. Press each ball flat, about 1 inch thick. 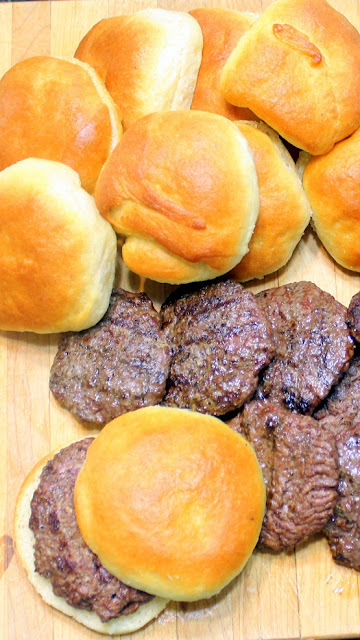 Lightly brush each bun with melted butter. Cover the baking sheet with a tea towel and set in a warm draft free part of your kitchen. 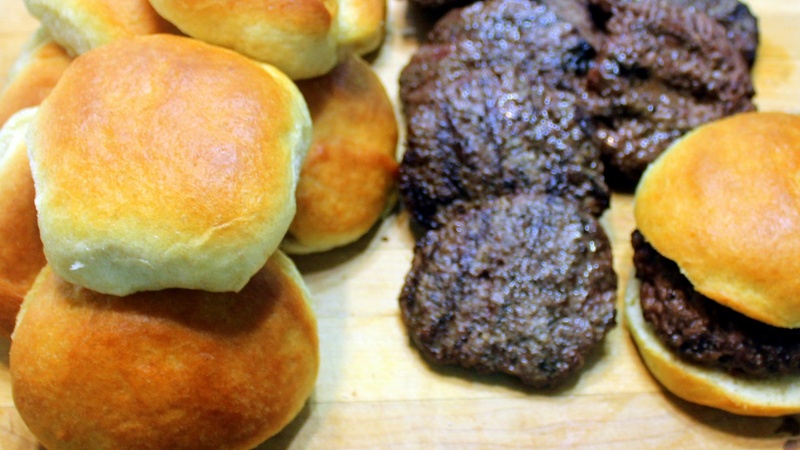 Allow a second rise for about 30 minutes (each bun will puff up about 2 inches tall with a nice rounded top. Meanwhile, preheat your oven to 400 degrees. Set a 9X13 casserole pan with 1 inch of water in the bottom rack. Once the oven has pre-heated and your buns have risen, bake for 17 minutes until the tops are a deep golden color. Set them on a rack to cool, brush the tops again with melted butter. 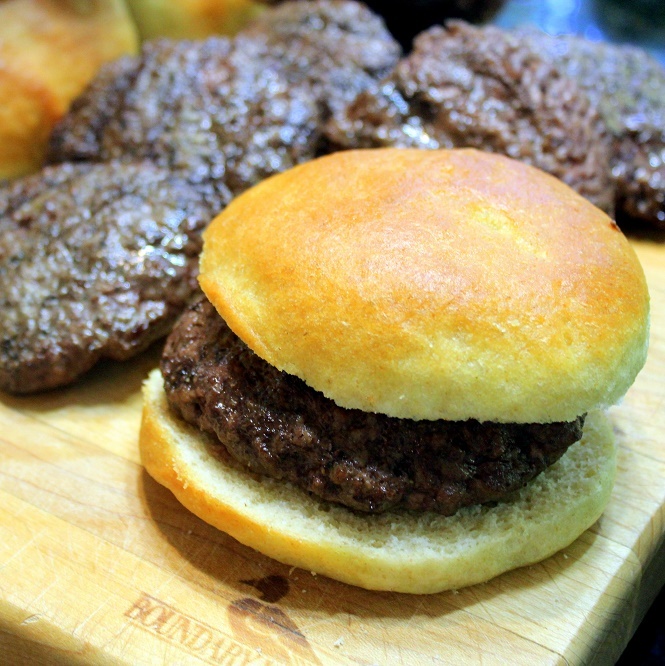 Slice and serve with the burger of your choice and of course... ENJOY! 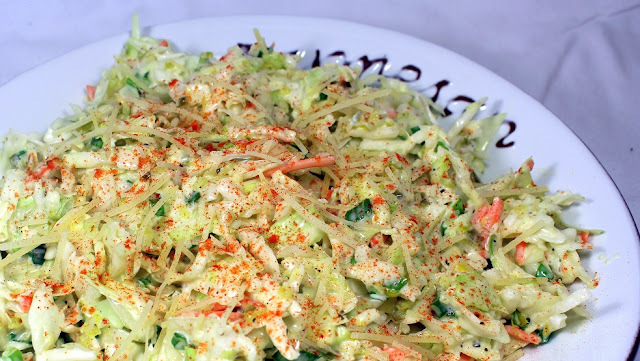 Here's another in my on going quest to make the simple (and inexpensive) bagged Cole Slaw into something just a little more special... Even memorable. And indeed this is very memorable. A little sweet (Sugar and sweet pickle relish). A hint of tart from the zest and juice of a lemon. A rich nutty cheesy taste from the Parmesan cheese. And all held together with a bit of the extraordinaire... Mayonnaise! 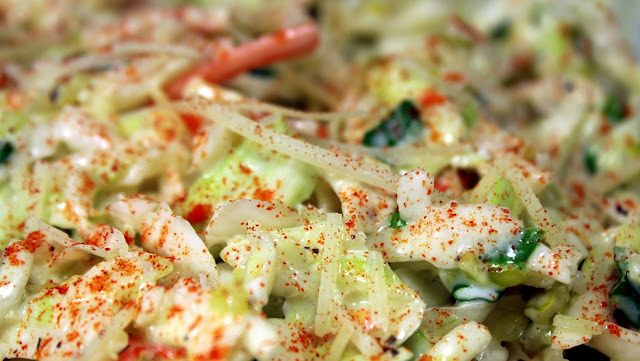 And once you have the slaw ready, a simple dress up tip to sprinkle some Paprika on top. It does add hints of spice but also the contrasting colors of the bright red and bright green (wrapped in white) make for a beautiful presentation dish. A dish perfect for just about any lunch snack or will stand proudly alongside the other dishes at any PotLuck, big family gathering, summer picnic or neighborhood pass-a-plate meal. 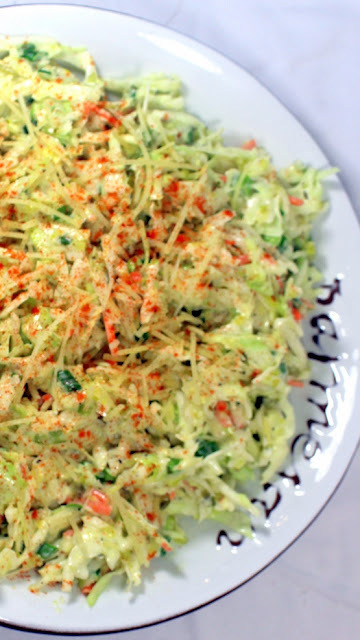 A delicious, beautiful upgrade for a simple inexpensive bag of Cole Slaw... Enjoy! 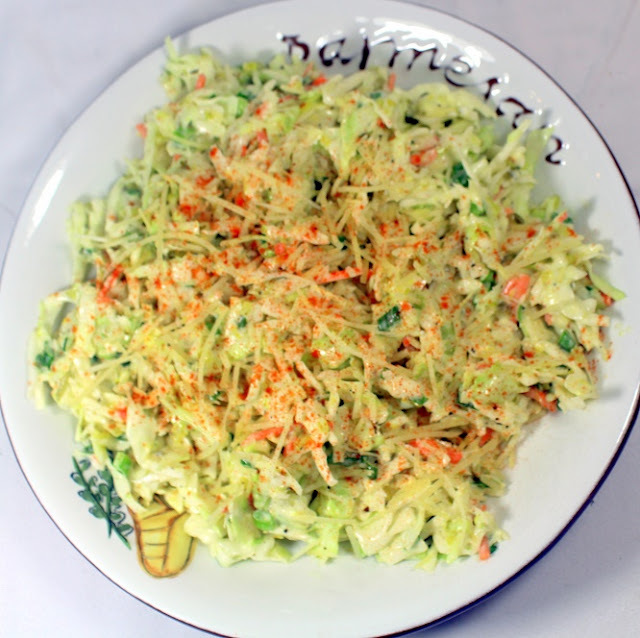 In a large bowl, whisk together the Mayo, Pickle Relish, Sugar, Salt, Lemon zest and Juice plus the Parmesan Cheese. So, I am also pleased to list this as one of my Growing list of "52 Ways to Cook Side Dish Recipes"!!! This is my GO TO recipe when I need to bring something to impress. 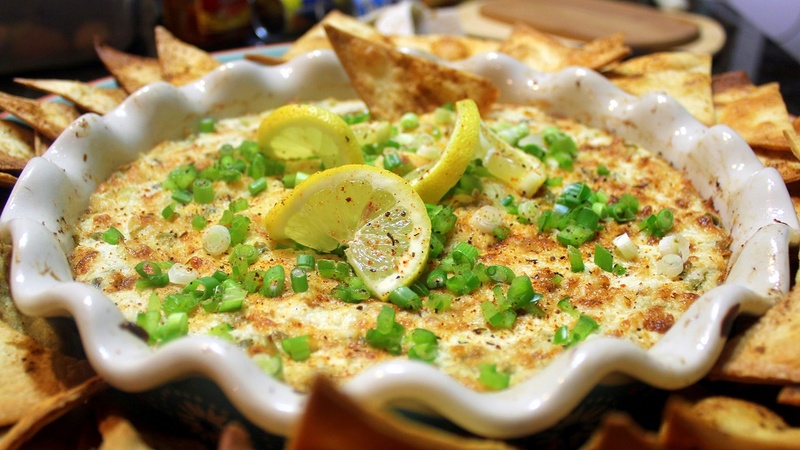 A rich lemony mixture of Lemons and Cream Cheese made smooth with a bit of mayo. This is very addictive. Don't be surprised when your guests flock to the dip bowl and hang out until it's gone. 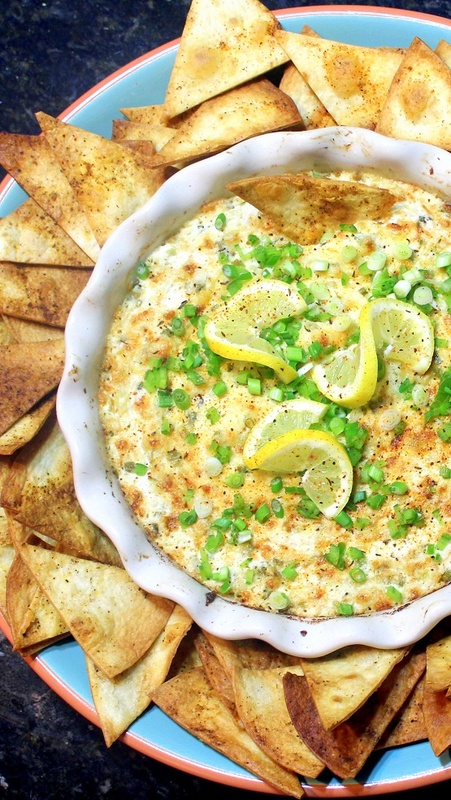 The dip is very easy to make. Simply mix well and a quick bake to heat and get that golden brown and delicious look. For the baked tortilla chips, simply buy some flour tortillas. Cut into edge shapes. 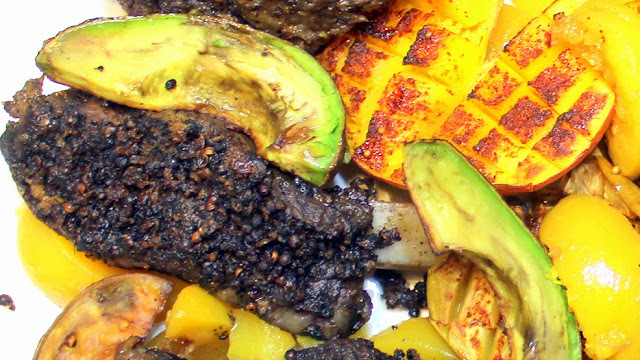 Brush each wedge with butter and season with taco seasoning. Lay each wedge in a single layer on a cookie sheet. Bake at 350 degrees for about 10 minutes until the wedges have started to dry out and crisp. 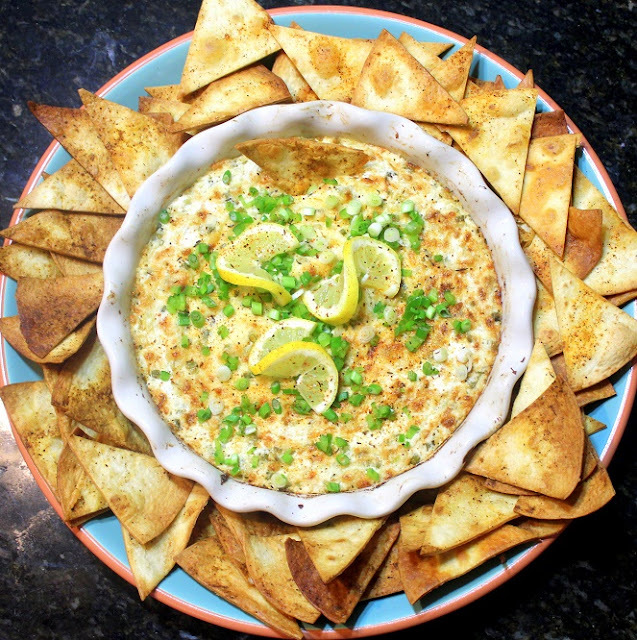 Serve alongside the dip for extra bragging rights. This is such a winner. 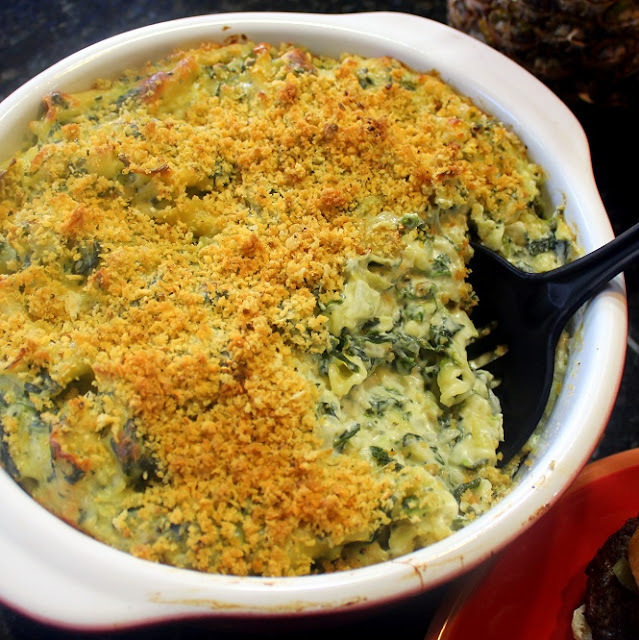 Perfect for any small dinner party, big family get together, the church ladies will be green with envy if you bring this to the church PotLuck and of course a great "game day" snack for your Super Bowl party! 1 Jar (14 Ounces) Artichoke Hearts, Quartered packed in Oil, drained and chopped to half dime size. 4 Green Onions, diced, whote and green parts. Combine cream cheese and mayonnaise in the bowl of a stand mixer. Using the paddle attachment, add the minced garlic paste, artichoke hearts, crabmeat, lemon zest and juice as well as the chopped green onions and Parmesan cheese with the seasonings. Mix on low for a full minute until thoroughly combined and evenly mixed. Spoon mixture into an attractive shallow baking dish (I like to use a fancy Pie Plate for this... Just the right size. Bake for 30 minutes until top just starts to brown. Garnish with lemon slices and additional chopped green onions. 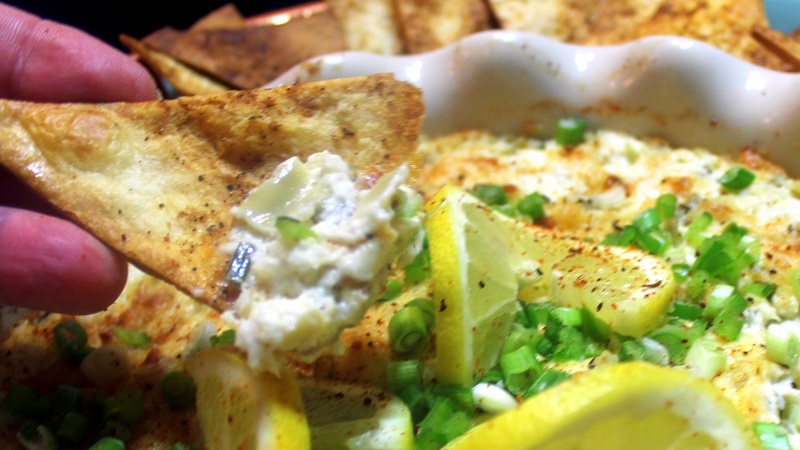 Serve hot with baked tortilla chips and ENJOY! A Fantastic Appetizer. 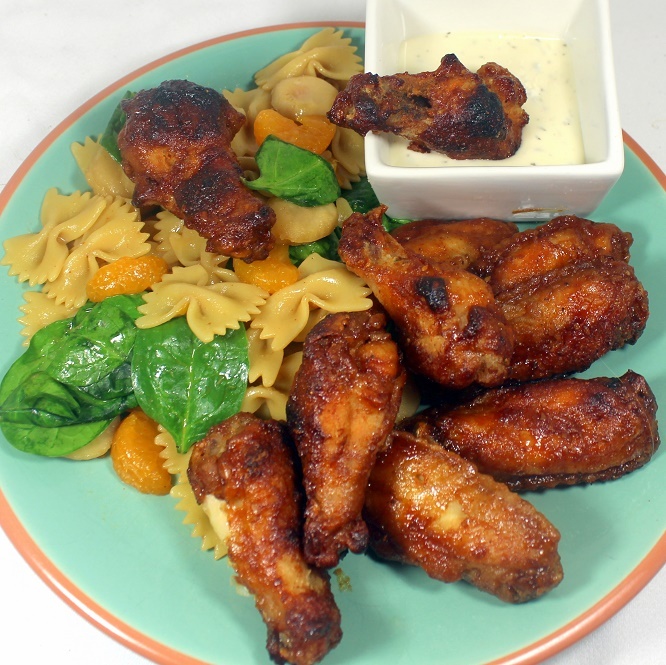 Crispy fried chicken, all dressed up with a heat and sweet sauce... A Favorite! One of my "52 Appetizer Recipes" Collection (Plenty more than 52 actually, A great place to find ideas! I do love Chicken Wings! And these are just about as good as they get. Fried first to insure a crisp skin. Then flavored with a sauce that is honey sweet, with Earthy complex Teriyaki Asian flavors and all spiced up with a bit of Red Heaven - Sriracha Sauce (The red Rooster hot sauce). And finally, baked to a crisp and slightly caramelized final product. Worthy of the finest bar snack menu. Worthy to serve to your best buds for half time of the greatest game of your life. 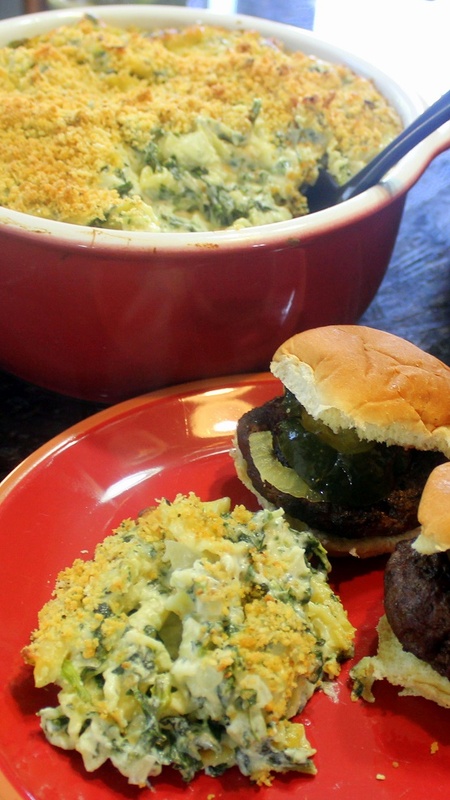 Just a quick tip, these can easily become a terrific dish to take for a tailgate party. 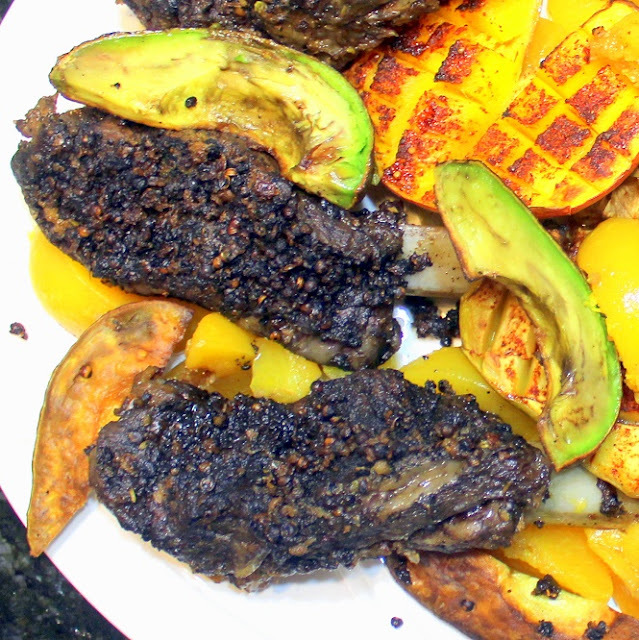 Once sauced and crisped up, dump into a crock pot and off you go. They will lose a bit of crispness in the waiting, but are still wonderful. 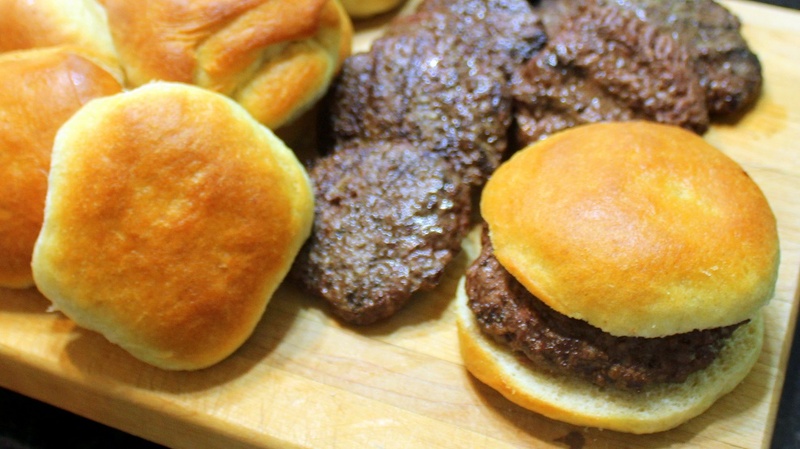 You can also add these to a tailgating menu. Especially if you have a grill. Simply cook them as directed through step 8 below... That is, flour, fry and sauce the wings. Then wrap them tightly in aluminum foil and store in an ice chest (no ice) until ready to finish cooking. 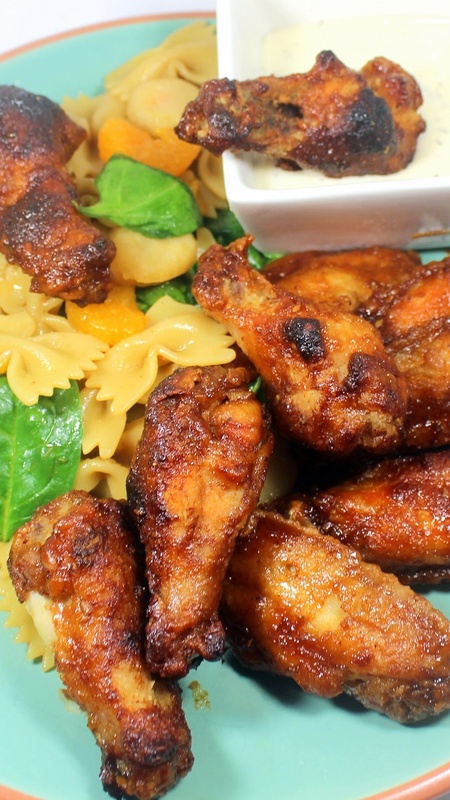 Then set your grill for indirect heat (Coals on one side, no heat source under the opposite side) and use your grill as an oven for the final step of crisping and caramelizing the sauce on the wings. 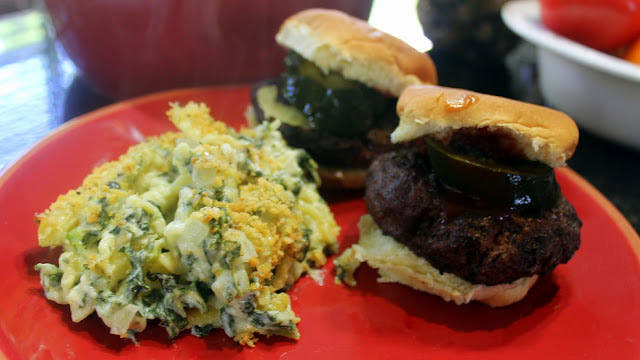 You will be the hit of the tailgate party! 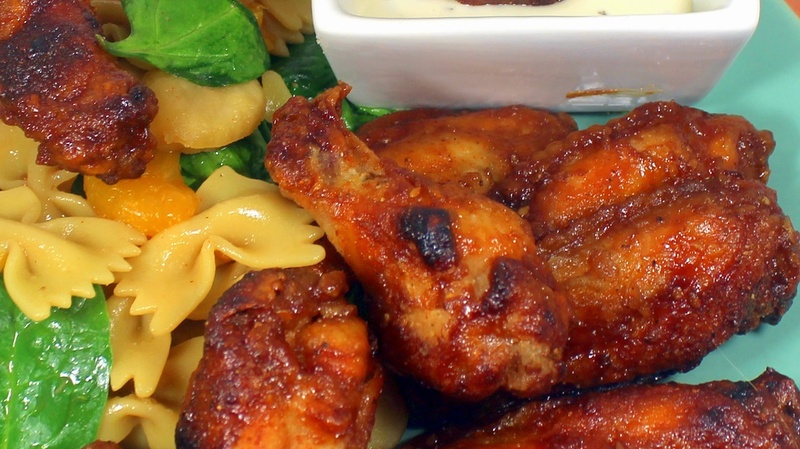 Dry each chicken wing with a paper towel. In a ZipLock bag, add the flour and cornstarch (Shake to mix). Then add the chicken wings, seal and shake to coat. Work in batches, add 1/2 of the coated wings to the oil. Do not crowd the wings, allow them to have their space, not touching the other wings. Fry for 8 minutes, flip the wings and fry the other side for another 8 minutes. While the wings are cooking, prepare the sauce. In a large bowl, add all of the ingredients for the sauce. whisk well to combine. 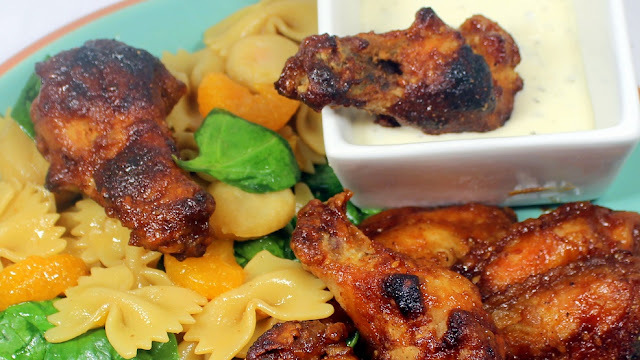 When all batches of wings have been fried, add the wings to the bowl with the sauce and mix to evenly coat each wing. Line a rimmed cookie sheet with aluminum foil (for easy clean up). Place the wings on the sheet, again giving space, not touching. Bake for 15 minutes until the skin begins to crisp up and caramelize. Serve Hot with a Blue Cheese or cool Ranch dipping sauce and ENJOY! OK... Add this to my list of the greatest foods I have ever eaten. And actually move this to the top! NO JOKE, these are about as good as it gets. 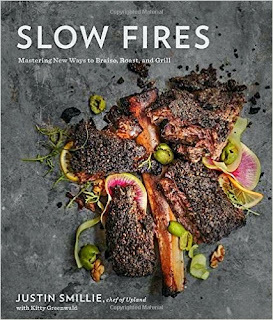 A diligent crisping, a murmuring simmer, a slow roast, a ripping hot sear: mastery of the subtleties of heat and time is Justin Smillie's hallmark. In this book, the celebrated chef of Upland explores the fundamental techniques of braising, roasting, and grilling--and shows you how to see them in new ways, to learn the rules to break them. This is a book about delighting in the details, about cooking by hand, about learning to see and smell and touch like a modern master. It's a book you will keep, read, learn, and cook from for years to come. I could not agree more. One of the best cook books I have ever read with detailed instructions, restaurant worthy menu pairings with side dish recipes meant to be served along side each main dish. Plus the mind of a chef is explored as he walks us through the delights of each dish. The book is beautifully laid out with photos of nearly all dishes. The instructions are detailed and the notes and suggestions at the end of each recipe will make these restaurant dishes come alive in your kitchen! This is indeed a "You can do this" book that gives you all the confidence you need. As to these ribs... Simply WOW... This may be the most complicated recipe I have ever attempted. Brining, Confit, Searing, roasting and more taking at least 3 days (actual hands on working time, much less than an hour or so). 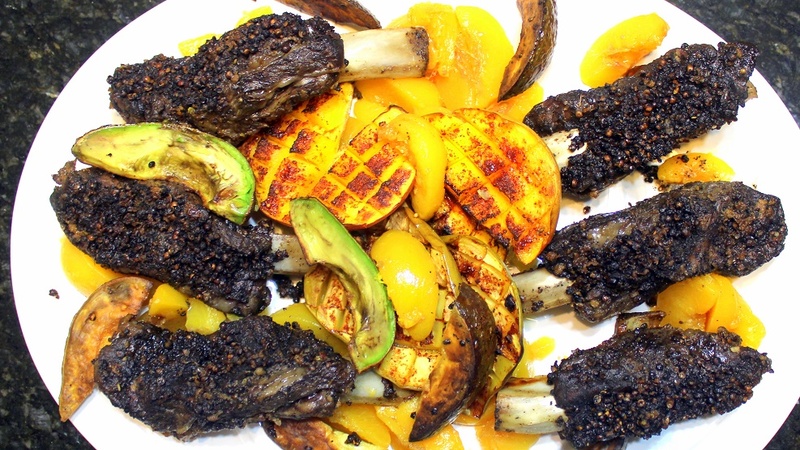 But, if you are looking for a meal to impress, something special for a dinner party, These ribs are for you! And a BTW... I recently made these a second time at a tailgate party for a WORLD CHAMPION Kansas City Royals ball game. I Did all the steps at home until the last. I brought the dutch oven with the ribs inside to the game, set up my trusty Weber Grill and baked them using indirect heat (Coals bunched up on one side while the opposite side was left without direct heat). With the lid on, Ribs were then baked until ready (about 15 minutes)... The HIT of the game (sadly, the Royals were not as successful, but that's just one of 162 games! Brine the Short Ribs (at least 72 hours (3 days - 2 days to brine, 1 day for the confit rub) before cooking the ribs) - Set a medium heavy saute pan over medium-high heat and slick it with 1 TBS Olive Oil/ Once the oil is hot, lay the onion halves cut side down in the pan. Sear the onion for 8 minutes until blackened. Pour the water into a nonreactive container. Stir in the kosher salt, and sugar until desolved. Add the burnt onion, 2 TBS black peppercorns, and the coriander and fennel seeds. Bruise the bay leaves and add them to the brine. Squeeze the lemon halves into the brine, tossing the lemons in as well. Submerge the beef short ribs into the brine. Transfer the container into the refrigerator and chill for 48 hours. Confit the Peppercorns (12-24 hours before serving cooked ribs) - Place 1 cup black peppercorns, along with the green, pink and white corns in a medium pot and pour in 3 cups of Olive Oil. Set the pot over low heat and bring the oil to a light simmer. Once simmering gently, cook the peppercorns for 20 minutes or until the pink peppercorns smash easily. when pressed. Remove from the heat and let the confit cool to room temperature. Cover the pot and refrigerate for 12 hours (Will store in the fridge for up to a month). Make and Apply the Rub (12-24 hours before serving cooked ribs) - Remove the confit from the fridge and let stand until room temperature. Drain the peppercorns from the oil and smash in a large mortar and pestle until a wet gravel like paste forms. Add additional oil as needed to achieve the consistency of wet sand. Alternatively you can pulse the peppercorns in a food processor. Remove the ribs from the brine and thoroughly dry with paper towels. 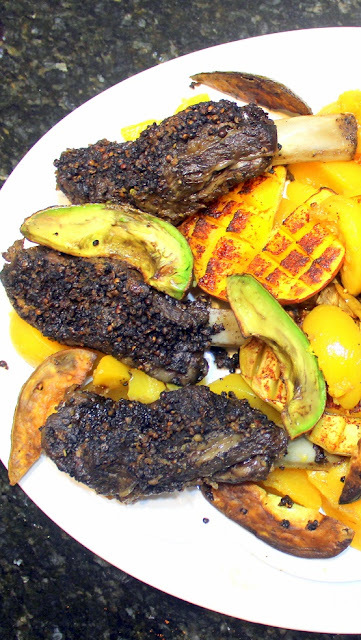 Slather the Beef ribs with the confit paste (the meaty side). Place the ribs on a cooling rack set over a rimmed baking sheet and refrigerate. Let the meat rest for 12 to 24 hours. or until the rub hardens and feels leathery to the touch. Steam Roast the Ribs (1 hour before roasting) - One hour before roasting, remove the beef ribs from the fridge and allow the them to come to room temperature. Preheat the oven to 350 degree. Place the ribs peppercorn side up in a large dutch oven or a deep roasting pan. Seal the pot or pan with a double layer of aluminum foil before securing the lid. Slide the pot onto the center rack and roast for 3 hours or until the meat is plump and bouncy. Each hour check to see if there is any liquid in the bottom of the pot. If dry, add a splash of liquid to steam the beef. After 3 hours, remove the dutch oven from the stove. Remove the cover but let the aluminum foil stay sealed. Let the meat rest in the steam for another hour. Section and Sear the Ribs (When ready to eat (Finally)) - Preheat the oven to 400 degrees. Set a heavy Saute pan or Cast Iron skillet over medium high heat. Swirl in enough olive oil to cover 1/2 inch. Once the oil is shimmering hot, place the ribs in the pan with the peppercorn side submerged. Sear at a steady sizzle for 4-5 minutes, or until brown and just starts to crisp. While searing, be sure to roll the meat on it's arch so the meat browns evenly all the way across the rubbed surface. Once the crust has formed, transfer back to the Dutch Oven, removing the lid and roast for an additional 15 minutes for the crust to set hard without burning. remove from oven, allow to rest for 10 minutes... Serve HOT and ENJOY! Love the recipe and love the book! Here's the legal stuff... "I received this book from Blogging for Books for this review." But the review and opinions are 100% accurate and mine!". Love this book and highly recommend it! I am so thrilled to add this book to my library. A terrific inspiration and reference that will send my get to gathers to that next level. This is a little bit of a book review along with a recipe (Posted for review). The recipe comes from The Chopped Cookbook: Use What You've Got to Cook Something Great . This is the cookbook, published by the folks at the Food Network and based on their hit TV Series, Chopped. BUT WAIT, before you pre-judge, this book does not feature odd combinations (Steak and Jelly Beans), Instead the book features recipes that use mostly items in your pantry. Now, I am a coupon and "what's on Sale" shopper. If I get a great deal and I happen to have used the item in the past, I will pick up a can, jar or frozen item just because it's on sale. So, my pantry is pretty well stocked. But even the hobbiest cook with only a sparsely stocked pantry will find great ideas with only a small number of ingredients to buy. I had everything in my pantry except the Artichoke Hearts. 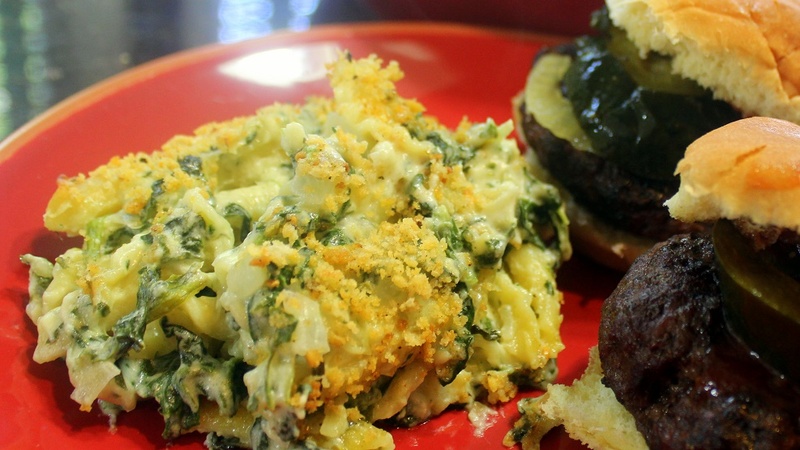 You may need to add the Mozzarella and the Spinach to your shopping list but this dish is worth the effort. Everyone loves Mac and Cheese. And this one rates up there with the best. The flavor combination comes from a likely spot... The famous Spinach and Artichoke Hearts Dip. Made famous in countless Happy Hour menus and deservedly so. Delicious. Very easy to make, the sauce takes just about as much time as it does to cook up the pasta. Reheats very well. Best to add an extra bit of whole milk just before reheating. Preheat oven to 400 Degrees, Bring a large pot of salted water to a boil. Heat butter in a medium saucepan over medium-high heat. Stir in the onion, 2-1/2 tsp salt and a couple of turns of pepper and cook, stirring occasionally until golden, about 6 minutes. Stir in the flour until combined. Back to the sauce, while the pasta is cooking, add the spinach and artichoke hearts and simmer until thickened, about 10 minutes. Stir in the mozzarella, remove from heat and transfer sauce to the pasta pot. Stir to evenly mix. Transfer the pasta to a large 3-1/2 quart baking dish. Toss the Panko bread crumbs with the olive oil. Sprinkle these on the top of the pasta in the baking dish.